There are six-identified population units of Southwest BC, click the links below to learn more. The Stein-Nahatlatch grizzly bears are bounded by the Fraser River, Lillooet and Harrison Lakes and capped by the Duffy Lake portion of Highway 99 and Anderson and Seton Lakes. They have adapted to some of the most diverse and challenging habitat in the Coast to Cascades region. It includes the lush alpine meadows of the eastern Coast Range and Duffy Lake, Stein-Nlaka’pamux Heritage, Mehatl Creek and Nahatlatch Provincial Parks, down to the dryer sage and grassland benches of the upper Fraser Canyon. Straddling the Cascade Mountains the North Cascades grizzly bears are transboundary, sharing habitat in BC and Washington State. This highly endangered grizzly bear population, estimated at as few as 6 animals, is separated from BC’s coastal grizzly bear populations by the Fraser Canyon, Highway 1 and two railroads and is bounded on the east by the Similkameen River. The Squamish-Lillooet grizzly bear population is bordered on the east by the Squamish and Cheakamus Rivers and the Sea-to-Sky Highway. Sitting astride the southern end of the Coast Range, the Squamish-Lillooet grizzly bears have survived primarily in the headwaters of more remote valleys where the habitat is more secure. These include the Ryan River and the undeveloped headwaters of Callaghan Creek, the Soo, Elaho, Ashlu and Tzoonie River. The South Chilcotin Ranges grizzly bears’ sweeping range includes, at its northern end, Chilko and Taseko Lakes and Nemaiah Valley. In its center lies Big Creek, South Chilcotin and Yalakom Provincial Parks and the Bridge River. 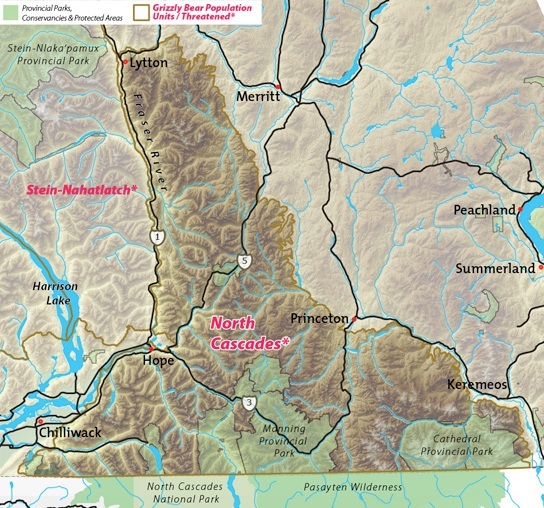 On its southern edge are the critical upper Lillooet watershed and the communities of Mount Currie, D’Arcy, Lillooet and Pavilion. The Garibaldi-Pitt grizzly bears have the distinction of living virtually in the shadow of Vancouver’s high-rises. There is no other major North American city that can make this claim. Sightings of grizzly bears in Garibaldi Park and environs have been rare, indicative of the extremely low numbers in the population. But in 2011 a local guide filmed a grizzly bear fishing for salmon in the Pitt River and in spring 2013 biologists documented a female crossing Highway 99 into Garibaldi Park. 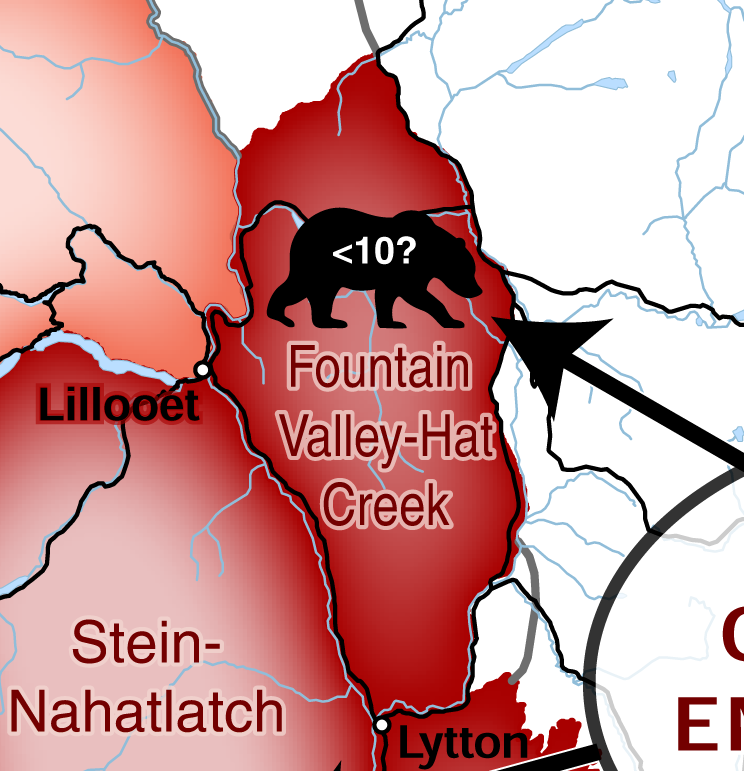 The Fountain Valley-Hat Creek grizzly bears inhabit a relatively small (1,400km2) triangle shaped area between the Fraser and Thompson Rivers, south of Pavilion. Very little is known about this population. In 2007 a female and two yearlings were sighted and a bear was shot in 2012 which shows that bears at least recently occupied and may continue to exist in this area. The population is very small, likely fewer than 10 bears and habitat in this area is relatively poor.. Female immigration is unlikely as adjacent population of Stein-Nahatlatch and North Cascades are also very small and Critically Endangered populations.There is currently no plan or conservation priority for grizzly bears in this area.